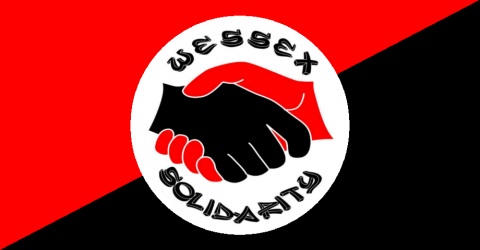 Dorset Eye is a vital resource for communities and activists, providing local, regional and international voices on a wide range of topics determined by the public. Since 2012 thousands of people have contributed news and analysis to a website that is unique in the UK, supporting local democracy, defending public services and keeping a close “Eye” on those with authority and influence.We aim provide an empowering democratic experience, so the website is run entirely by volunteers operating on a not-for-profit basis. The site is clean of corporate advertising: content is at the centre of the media experience. With growing costs and ambitious plans to become a model that can compete with the corporate media we need a significant increase in resources, especially through financial support. “Dorset Eye provides a quite unique example of citizen journalism in action – giving local people a venue to write about and debate topics that range from parking, crime, traffic issues, the impact of austerity on local NHS provision, to Brexit, climate change and the mainstream media’s failure in its reporting around Saudi Arabia and the war in Yemen. No other local media in the UK is so open to citizens’ voices across such a wide range of topics and stories. Please circulate this message to your friends, workmates and neighbours, and through your community, trade union, party and other networks. 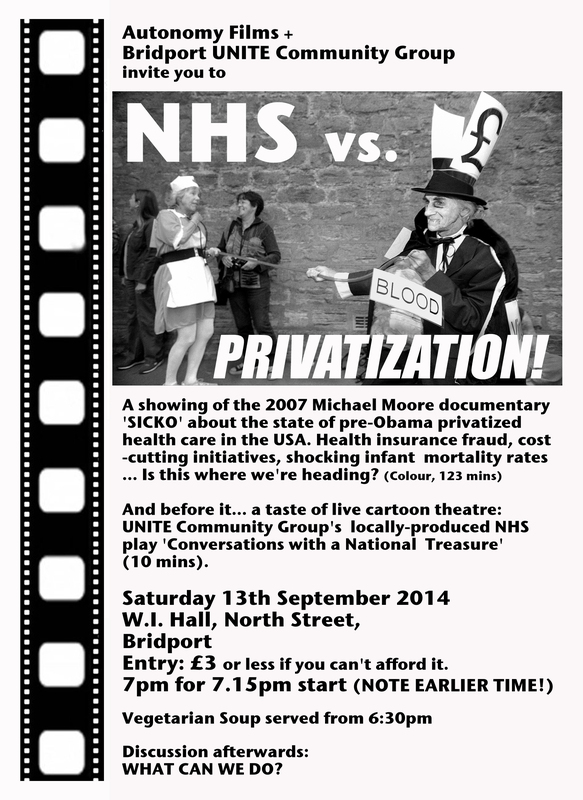 Autonomy Films and UNITE Community Group invite you to: NHS vs. PRIVATISATION! Saturday 13th September 2014. W.I. Hall, North Street, Bridport, 7pm for 7.15pm start (NOTE EARLIER TIME!) Entry £3 or less if you can’t afford it, Vegetarian soup served from 6.30pm. Discussion afterwards: What can we do? Saturday 6th September. The 999 March for the NHS reaches London. New feature film about lesbians and gays supporting S.Wales miners in the 1984/5 strike. At: Cineworld, Yeovil FREE: ring to book. ADVANCE NOTICE: Saturday 18th October (Same day as London Anarchist Bookfair) National ‘Britain needs a pay rise’ demo in London organised by TUC. Assemble 11am on the Embankment near Blackfriars, dept. 12pm for rally in Hyde Park. And before that, a one-day strike on Tuesday 14th October. That’s from Unison, same statement can be found at Untie the Onion, it’s mentioned on the GMB site, and many Unison locals have their own plans but it seems there isn’t a single TUC strike page to co-ordinate and promote all the local actions and pickets for this (we’ve looked) why not? Tell you what, if you send your action’s details to us we’ll put them up here. Watch this space. 50% pay cut for ex-NHS carers in Dorset. In 2011 approximately 160 adults with severe learning disabilities and challenging behaviour were transferred from long stay hospital units and moved into their own homes. The private sector stepped in to provide care for these people and staff were personally matched and TUPE transferred with each individual. The promise was that any private care provider bidding for one of our clients had to show they could ensure our contracts for 2 years minimum, employ new staff on the same pay as the NHS workers to avoid a 2 tier workforce, and help with retention of new staff. A few weeks after the transfer it became apparent this was not the case; providers were employing colleagues at a much lower rate. By October 2012 the provider ‘Dimensions’ had cut one third of staff’s salary in the form of lost enhancements, change to overtime rate, reduction in annual leave, loss of sick pay, reduced maternity leave etc.. Staff on average lost between £300 and £500 per month in take home pay. For one reason only, many staff accepted the cut at that time while others were dismissed and re-engaged. This reason being respect for those we care for. In Dorset many of us have worked for decades with these people, and have seen them uprooted and socially isolated in their own homes, often with strangers (agency staff) coming in to care, having lost day care provision and suitable transport, we felt so soon after this monumental change in their lives it would be beyond heart-breaking to remove the stability of those they had grown to trust over the decades, so we bit the bullet and continued to provide good care for our clients with the facilities we have. ‘Lifeways’, another of these providers, early in 2014 not only cut their staff’s wage in a similar fashion to Dimensions, they also reduced the hourly rate by 20% at the same time leading to huge reductions in take home pay. For example, a single parent of 3 previously took home £950 per month for part time hours – for these same hours she will now take home £389 – less than her mortgage payment alone and that is after 27 years in the service. Again those that did not sign to accept this cut were ruthlessly dismissed and re-engaged. In March 2014 Dimensions staff received a further letter stating their hourly rate would be cut by £1.90 (a 20% drop this time). This is going to force the long term staff to search for work elsewhere a choice they cannot take lightly but for reasons of survival will be forced to, having devastating effects for those we care for. Stability is essential for their quality of life and the staff realise this as we have, in many cases, dedicated our lives to the vocation. Both Dimensions and Lifeways insist the cuts are only necessary because the local authorities who commission the work to such companies have cut the budget and they cannot survive as businesses unless they do. This appears to be their priority – survival as a business – rather than the devastation they are about to unleash on staff and vulnerable people. That said, other private providers locally receiving the same amount of money from the authorities have kept their ex NHS staff on their original terms and conditions without going out of business. Despite staff arguing that the cut of £1.90 per hour to 42 Dimensions staff in the area, will result in recruitment and training costs higher than the saving made, Dimensions are well aware of this and stated they are looking at the long term stability of the company, so to us as staff this devastating upheaval is completely unnecessary, especially when you learn extra directors with huge salaries have been employed, managers have been cut in number but received an increase, deputy managers have been put in place and a bonus will be paid to all staff in April due to a profit share scheme. In what world can carers and those we care for be treated this way – in a tory world where profit is put before people time and time again, I would ask everyone reading this to imagine losing 50% of their wage within 2 years, through no fault of their own and in fact for taking more responsibility now than we ever did as a care worker in the hospital units. Where does this leave me? Other than fighting against this cut I cannot look the gentleman I have looked after since 1999 in the eye for fear of how I am about to let him down, let alone his family and how they will feel when those staff they trust implicitly are priced out of the job. Not to mention how to pay my bills and care for my own children. 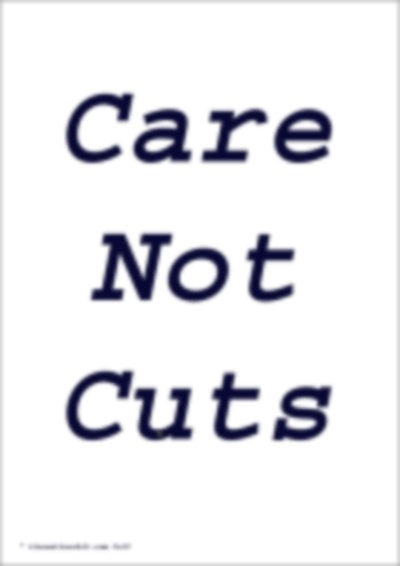 If you have been affected by cuts to care in any way, whether you have lost your day care, lost you benefits, mobility car, a carer who has had their wage slashed, a care provider who is having to slash their staff’s wages or simply someone who cares please join us in the “CARE CUTS HURT” demo outside Poole Council meeting. Let those that are making the decisions see the human cost, bring a placard, bring your personal story written down to be collected for presenting to the councilors at a future date. Enough is enough with 60% of cuts still to be rolled out we must make ourselves heard.